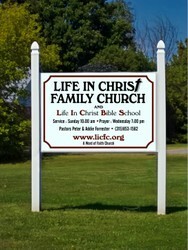 Welcome to the Life in Christ Family Church website! At LICFC, we are committed to the uncompromised Word of God and to a lifestyle of love. We want to help people to know the Lord Jesus, to reach their full potential in His service, and to be overcomers in His name! LICFC has partnered with Life Christian University in Tampa, Florida, to bring Spirit-filled, Christian educational programs to our area. There are eight courses offered per year, each running three hours a week for four weeks. Information on future classes will be listed under Upcoming Events. For more information about Life Christian University, click here. A Used Clothing Drop-off Shed is located on the parking lot of Life in Christ Family Church. Click here for information about what items may be donated. Disclaimer: Life in Christ Family Church is not responsible for any advertisements that appear on its website, nor does it endorse or recommend any products or services so advertised. Any advertisements are posted by our website host provider.